Diagnosis of lung cancer is a key to detect it early. As symptoms of early lung cancer are easily confused with many diseases, which is also an important factor resulting in patients’ delay of treatment. When diagnosed, most of patients with lung cancer have been in middle and even advanced stage, which is not conducive to the treatment. That’s why the diagnosis of lung cancer is so important. Chest X-ray: this is commonly first lung cancer imaging test you will experience. Central lung cancer in the early stage can show no abnormal signs in X-ray. When the cancer obstructs bronchus, causing obstructive pneumonia or atelectasis, or the tumor invades adjacent lung tissues and metastasizes to pulmonary hilus, mediastinal lymph nodes, mass in the region of pulmonary hilar or widened shadow in mediastinum can be seen. X-CT can show shadow of mass growing into bronchial cavity and the wall of its tube is irregular, thickening or the cavity is narrowing, blocked. X-ray of peripheral lung cancer often is manifested as nodular shadow around lung lobe or mass shadow, often showing small sublobe or notch with fine and short sentus. Diffuse bronchioalveolar cell carcinoma is manifested as infiltrating lesions, vague edge, a wide range of small nodules merging into a large shadow, which is similar to pneumonia. CT scanning: a CT scan of the chest may be ordered when X-rays do not show an abnormality or do not yield sufficient information about the extent or location of a tumor. CT scans are X-ray procedures that combine multiple images with the aid of a computer to generate cross-sectional views of the body. The images are taken by a large donut-shaped X-ray machine at different angles around the body. One advantage of CT scans is that they are more sensitive than standard chest X-rays in the detection of lung nodules, that is, they will demonstrate more nodules. Moreover, it avoids overlap of lesions with normal tissue, can find early lung cancer in hidden area that general x-ray cannot show (such as at tip of lung, above the diaphragm, around the vertebral column, behind the heart, mediastinum etc. ); CT enhancement scanning is valuable to determine whether there are porta pulmonis (hilus of lung) metastasis and mediastinal lymph nodes metastasis; the more; CT scans of the abdomen may identify metastatic cancer in the liver or adrenal glands, and CT scans of the head may be ordered to reveal the presence and extent of metastatic cancer in the brain. Magnetic resonance imaging (MRI): it can easily distinct the vessels, masses and lymph nodes in mediastinum and hilum of the lung. Besides, with multi-faceted imaging, it can better show the extent of tumors and involvement of blood vessels. However, CT scanning is highly recommended for pulmonary solid lesions. PET scans: differentiated from traditional imaging techniques, PET scans measure metabolic activity and the function of tissues. It can determine whether a tumor tissue is actively growing and can aid in determining the type of cells within a particular tumor. However, as for lung tumors, MRI may give false positive results on the tumors with low metabolism, particularly the alveolar cell carcinoma, and also on lung inflammation, tuberculosis, etc. 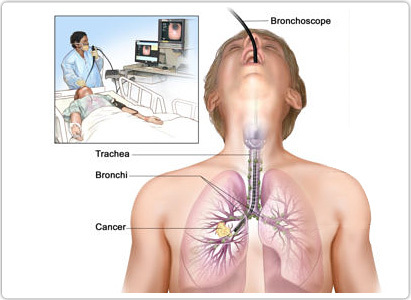 Pathology examination: diagnosis of lung cancer mainly depends on the examinations of tissue, cytology, and clinically many auxiliary examinations are used for collecting specimens of lung cancer. Cytological specimens mainly come from sputum, serous cavity effusion, brush biopsy by fiberoptic bronchoscopy and various regions of specimens by fine needle aspiration.